As far as mid-tier football boots go, the Nike Mercurial Veloce III is up there with the best of them. As cheaper option to the Superfly and Vapor, this boot has similarities to the more popular elite level options. 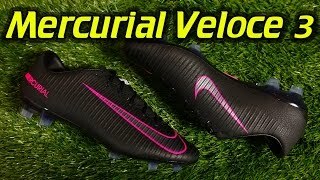 For players interested in the performance benefits of the Dynamic Collar, but don’t want to fork out for the top end Mercurial Superfly, then the Veloce III maybe the option for you. Nike hasn’t included the Nikeskin and All Condition Control technology which appear on the higher tier boots, instead opting for a textured synthetic. However, they have included a version of the embossed ridges that increase ball control, as seen on the Vapor XI, although these ridges are less prominent that that of the Vapor XI upper. 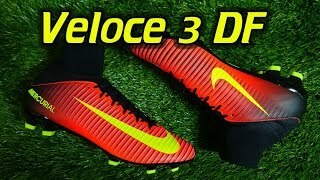 The Veloce III continues the top tier style with the tongueless design although the feel on foot is less soft than the Superfly and Vapor boots. 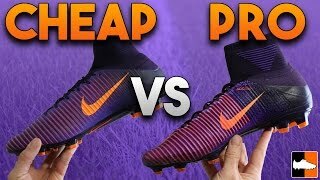 To save costs, Nike have included a TPU soleplate which is heavier than the light anatomical soleplate on the Superfly and Vapor models. However, the speed and traction design of the stud configuration are included in the Veloce III design, ensuring the boots are a great option for the pacey players.